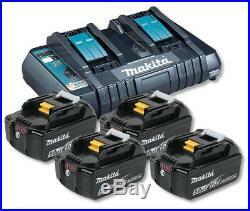 Makita DC18RD Dual Port Charger with 4 x BL1850B 5.0ah Li-Ion Batteries Kit. 1 x Dual Port Charger DC18RD. 4 x 5.0Ah Batteries BL1850B. Fast charging – charges 2 x 3.0Ah Lithium-Ion batteries at the same time in only 22 minutes. Built-in CPU – gathers information from the battery’s memory chip to determine optimum charging method. Forced air cooling fan – cools the battery to minimise charging time. Full charge sound alert. USB port provides 1.5A output for charging smart phones, tablets, etc. Slide on battery – firm holding with multi contacts and shock absorbing pack, will not puncture and remains cool even in heavy use. Unbeatable 36 minute charge time. Same weight and size as 3Ah or 4Ah battery. Works with your current Li-ion Chargers. Longer run time and battery life. Cell Capacity 1.5 – 5.0Ah. Charge Time 15mins (1.5Ah), 22mins (3.0Ah), 36mins (4.0Ah), 45mins (5.0Ah). Net Weight 1.9kg. Battery Ah: 5.0 Ah. 4 x 5.0Ah Batteries BL1850. This applies to all tools excluding batteries, chargers, outdoor power equipment and air tools. Contact AHC Powertools and we will advise the best course of action to get your tool repaired. 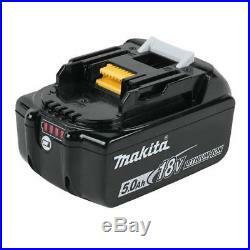 Generally, we will repair the product and send it back to you or we will return to Makitas Service Centre and they will return your repaired product to you. PLEASE NOTE – The guarantee does not apply where. Repairs have been made or attempted by others. Repairs are required because of normal wear and tear. The tool has been abused, misused or improperly maintained. Alterations have been made to the tool. This does not affect your statutory rights. 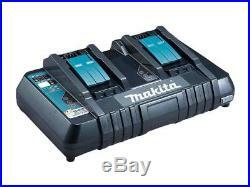 The item “Makita DC18RD Dual Port Charger with 4 x BL1850B 5.0ah Li-Ion Batteries Kit” is in sale since Wednesday, January 31, 2018. 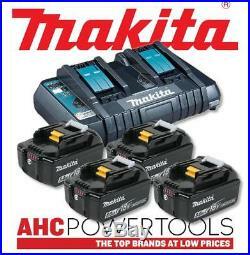 This item is in the category “Home, Furniture & DIY\DIY Tools & Workshop Equipment\Power Tools\Batteries & Chargers”. The seller is “ahcpowertools” and is located in Alloa. This item can be shipped worldwide.